37 - In the early 70s, Dr. Nicholas Costes, and later W. Trautwein, said a Kitchen patent of 1933 on an 'endless' propulsion system compete for the lunar vehicle missions Apollo 15, 16 and 17. This elastic titanium alloy wide curved band, 'Elastic Loop Mobility System' (ELMS) was developed at Lockheed Missile and Space Company, Hunville, Alabama and the U.S. Army Waterways Experiment Station (WES), Vicksburg, Mississippi. 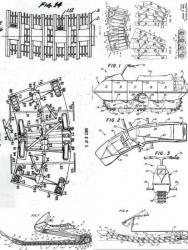 ELMS used only one wheel in front and one in rear but not intermediaries. 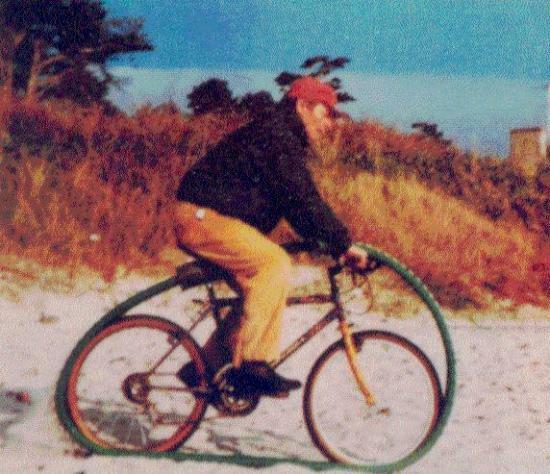 The elasticity of the ring kept the frame and secured the suspension. 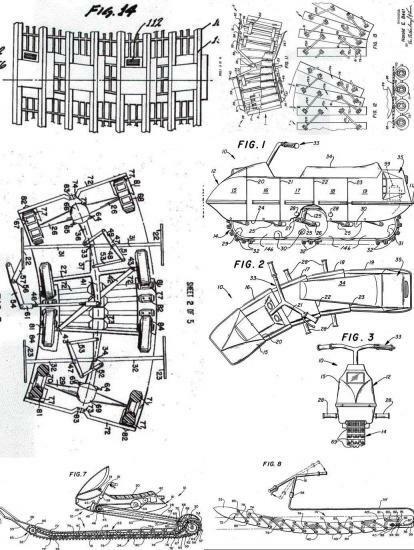 In addition to the desired lightness in astronautics, progress was smooth and fast, the system able to climb 35 degrees slopes, to cross two times the height of conventional caterpillar and with a good stability. 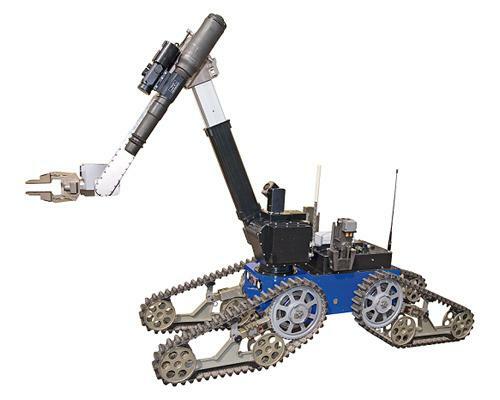 A 4-wheel drive 'Rover’ was sent to the Apollo missions and the Viking spacecraft in 1979 it’s the ‘Rocker-bogie' suspension which was chosen, not the ELMS. 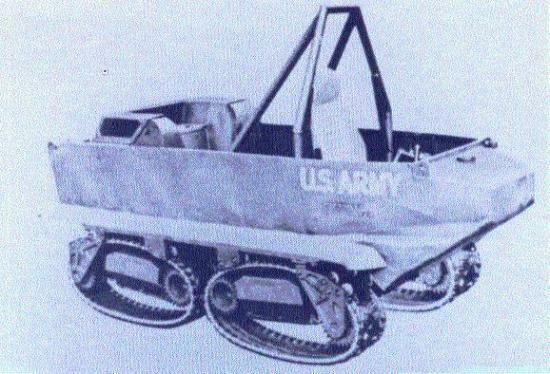 Nevertheless, Lockheed continued research with the U.S. Army George C. Marshall Space Flight Center (MSFC), Alabama, for a land vehicle, the LDV (Loopwheel Development Vehicle) in 1981 (picture) fitted with composite rings coated with rubber and toothed sprocket driven, reduced rolling resistance and reliability increased (22 000 to 30 000 km). 40 - The Tetrarch designed under the direction of L. F. Little from Vichers Elswick Works, England, rolled for the first time in 1937. 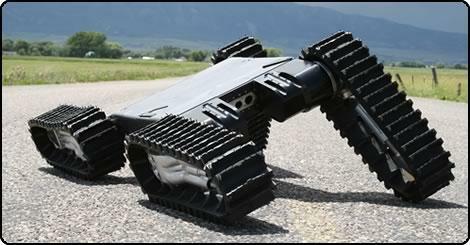 Provided with caterpillars that could bend to the right or left and enabling wide turns, this was a rare gear thus fitted mass produced. 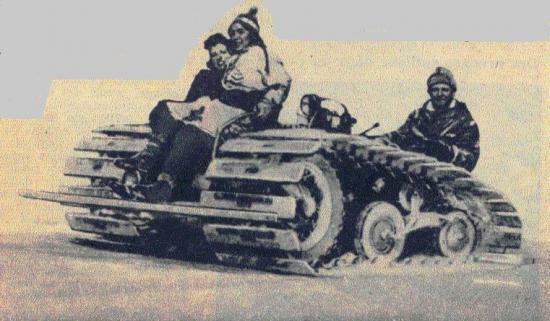 It took until the early 80s to find on the market a snowmobile without skis at the front but a single track driving and steering: the Snowmobile Finncat and its equivalent the FlexTrac MPV, from Finland, could be used on land. 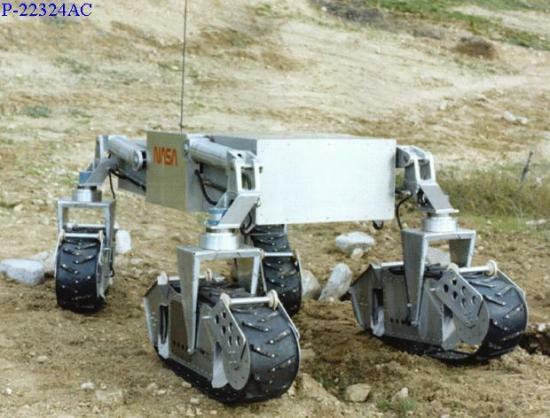 The Technamm Company, Lambesc, imported them in France : this picture of MPV by J M M date of August 1993. 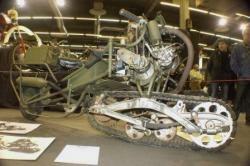 The caterpillar was dragged in the middle of its width. The sides, elastic material, could stretch or shrink in the corners. It unfortunately appears that this snowmobile had been less stable than a conventional snowmobile. 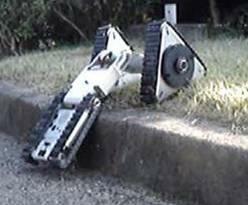 The robot Aurora of Automatika, Pennsylvania, built in 1999 by Hagen Schempf included a single track that could bend up or down, right or left. 41 - Galileo Viper is a small robot on wheels that can turn into caterpillars. 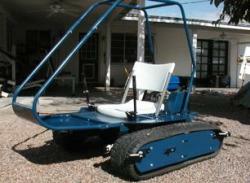 Developed since 1999 by Gallileo Mobility Instruments Ltd., Kfar Truman, Israel, for applications in farms, construction, off-road wheel chair for disabled and the Army. 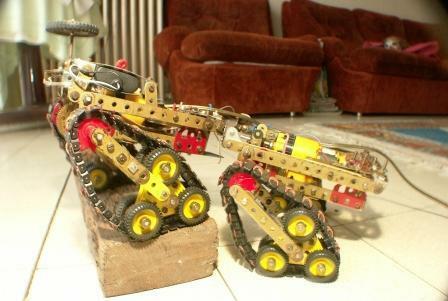 42 - The Millibot, Cargenie Mellon University in the early 2000s, whose many modules were automatically set together like a snake. It could thus cross large obstacles. Pict issued from Scientific American Inc., 2003 11. 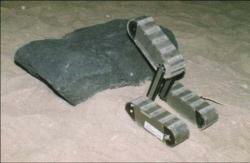 43 - ROSA, mini rover (1992-1994) of 1.5 kg in three parts, was investigated jointly by the Company Transmash VM, St Petersburg and the Max Plank Institute (MPIC), Munich. Picture shows well the system able to cross a wall of 300 mm, 29° slope sand, 65° slope on a carpet and a trench 300 mm wide. 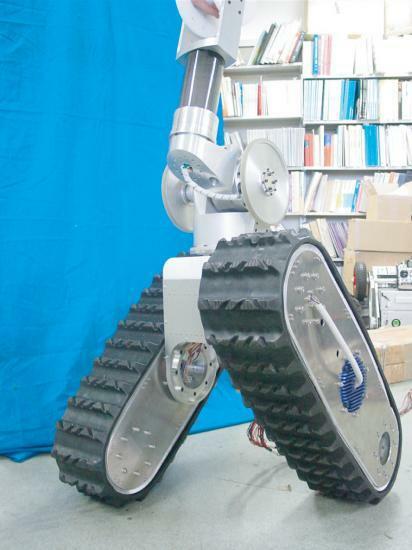 44 - The Advanced Industrial Science and Technology (AIST), introduced in 2007, Dir-1 inspection robot studied in fact by the Field Robotic Research Group. Original robot was equipped with a controlled and very efficient articulated tail. 48 - Soryu V, developed in 2003 by Shigeo Hirose as rescue robot, is the last of the series of Soryu. This one is sealed dust and water. 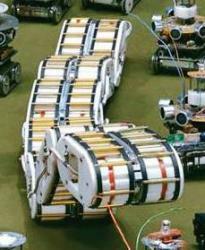 The tracks cover the entire active length and width of the robot. The steering lateral elastic rods avoid contact with the caterpillars. 51 - This articulated model built in Meccano in 2004 by the author has 4 tracks surrounding a Tri-Star wheel. 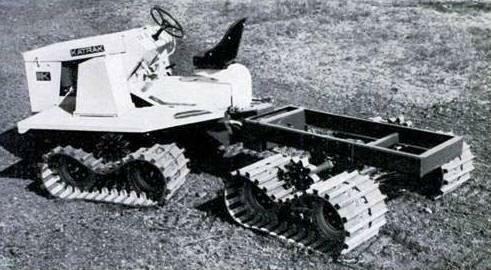 Pict J M M.
53 - Katrak K-60, marketed from 1969 by Katrak Vehicle Co., Canby, Ore., was a small articulated vehicle, the position of drive sprockets located above the track made it unusual. 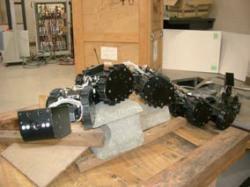 Hydraulic steering. 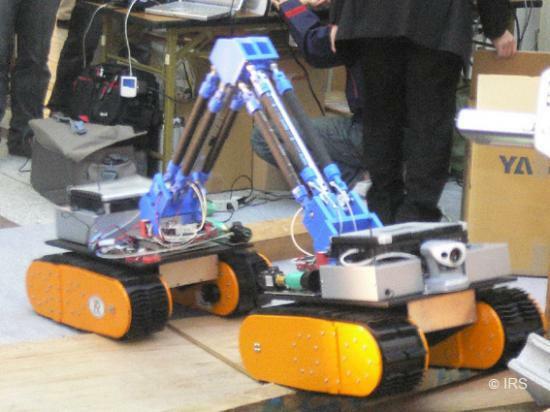 Mass 2230 kg and 2268 kg payload. Ford Engine 200 hp. J M M collection. 54 - In the 70s, the ATV Ranger of Arnold Manufacturing Co., Pengilly, Minnesota, had tracks around the tires. Empty weight 520 kg + 450 kg + 2 adults, 14 or 18 hp engine and 20 km / h maximum speed. 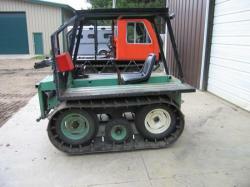 The Dalco 3000 Dahl Tractor Company, Cedarburg, Wisconsin, looked like the Ranger. J M M collection. 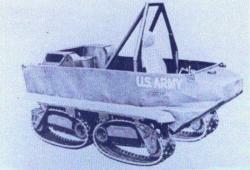 55 - In January 1948 appeared in "Popular Mechanics" a paper on the 'Tank Snow' to replace the dog teams in Northern Provinces. 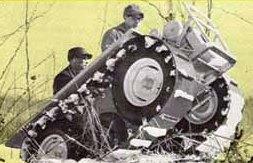 A 15 hp engine propelled it to 40 km / h. We know the result : under the leadership of Bombardier, the snowmobile was democratized, much later, in late 60s, with the Ski-doo. 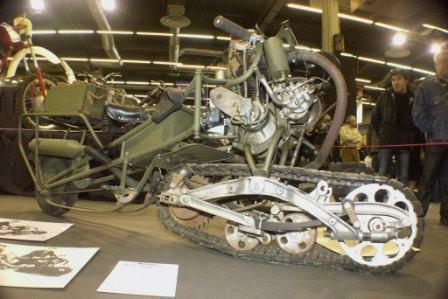 57 - The Type 3 Mercier tracked bike of Adrien Mercier in 1936, Swiss citizen based in Bois-Colombes, was tested at the contest of Vincennes by the French Army February 9, 1937. The engine of 11 hp Jap was a bit inadequate. Picture taken by J M M at Retromobile, Paris, 8-2-2007. 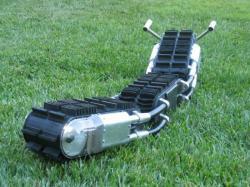 There was also the 'Lehaitre' and the ‘Courtot’ but nowadays, recent lighter models for snow (Attrax, Quebec or A-Tech Ltd. in Russia) took the market. 58 - Tracked bike of the inventor Patrick Carn is very easy to drive in sand or snow, probably even easier downhill. Seen in the 'Book of Inventions' of Valérie -Anne Giscard d'Estaing, about 1991.